Advertising is the art of convincing people that they really want something… a lot… and preferably, right now. Of course, when that “thing” is paying more in taxes, you’d better be pretty damn convincing. That is where content sequencing (or message sequencing) comes in. It used to be called ad campaign design, but in the digital world, as David Lloyd writes on ClickZ, you can build your message, reinforce it and connect with most of your target audience completely electronically. The operative word there is “most.” To capture 100% of your audience, effective messaging has to combine digital and social media content with traditional advertising reinforcement including that old stalwart, direct mail. For the Altadena Library Alliance, our marketing committee** had to introduce the Library Board’s old guard to digital and social media reinforcement. Initially there was some resistance to our newfangled digital ideas, because their trusty traditional campaign structure had succeeded so well in 1993, 1998 and 2004 (ironically the year that “TheFacebook” was first introduced). But we finally convinced them to embrace an active web presence, e-blasts, e-public relations, social media “liking&sharing” and community event evites into their mix. and they were rewarded with remarkable results. In even the most basic, traditional ad campaign design, the essential elements of sequencing exist: establish the product or proposition, then create a “need.” This strategy was absolutely essential for the libraries’ efforts because we had two separate and distinct messages to deliver. One: Our libraries are essential to our entire community. Two: We need 2/3 of you to vote to tax yourselves to keep the libraries vital. Library research revealed that about 60% of the electorate, many of whom arrived in the decade since the last parcel tax measure was passed, were not aware that Altadena had a parcel tax. Or that the parcel tax accounted for 1/3 of the overall library budget for the last 20 years, or even that the libraries in town were Altadena’s own. 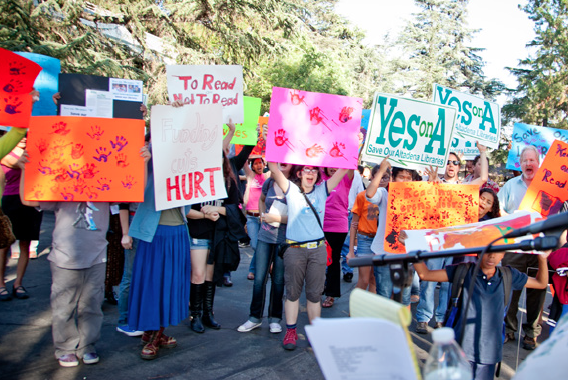 We knew we couldn’t succeed without significant community involvement, so in March we began a campaign with the theme “Our Altadena Libraries, READ ON!” to “educate” residents. We featured this message on a new web site, Facebook page, email blasts, in local news stories, banners, store-window posters and even on yard signs planted along major traffic corridors in town, and in front of the library itself. We provided our logo/headline to local groups such as the Altadena League of Women Voters, Chamber of Commerce, prominent city spokespeople and stakeholders for their own use, and enlisted them to share our Facebook posts, web updates and to place stories in their own publications to provide vital back links to our site that rapidly built our audience and the site’s “authority” and visibility. And the Facebook page “likes,” “shares” and “comments” let us know what messages had the most impact. In June, five months before the election, we began the second sequence of our message, the call-to-action, “Get Out The Vote,” with a new headline that employed the same sensibility we had spent the first four months establishing. We kicked off the new campaign with two events, a concert at a venerable Altadena nightspot featuring local celebrities, and a rally at the library. Both were promoted exclusively through e-vites, social media and word-of-mouth. The impact of the social media promotions was twofold. First they engaged younger, newer residents (and their friends and family) who made up the majority of that 60% of residents unaware of the parcel tax. And two, the essential social media aspects of fun and engagement enhanced the popularity of our social media. A win/win. The success of both these events created a buzz in the community reinforced by media coverage in Altadena, Pasadena and surrounding communities. Our donations and number of volunteers increased, and 200 of our “Yes On A” signs were picked up and are now appearing on all major arteries throughout town. Even our original “ReadOn” lawn signs are now in demand. A local cleaner on Altadena’s main thoroughfare, Lake Avenue, has donated the use of his Giant Marquee Sign in the last few weeks before the election. The community is now solidly behind our efforts. Our endorsements now included people of all ages, from all walks of life, all across the political spectrum. All of the schools in Altadena, and schools in surrounding communities, many of which lost their own libraries to funding cuts, have announced their support, which increases our committed audience by hundreds of families. Organizations actively promoting our cause have forwarded our email blasts to their mailing lists and are liking and sharing our posts. When the ballots were printed, there was no opposing argument. None of this “Get Out The Vote” surge could have been possible had we not initially connected with the 60% who were unaware of the libraries’ value – or the vital need for the parcel tax to keep their services going. Now our team is finalizing the last messages of the GOTV sequence, all built on the foundation we created in the first four months on line, in the news, in social media, and in posters, banners, fact sheets and lawn signs throughout Altadena. No matter what you call it, building a compelling sequence of messages is essential to success in advertising. ** An all-volunteer committee made up of marketing professionals including Debrah Lamattre, Bill Burnett, Deborah Laux, and Tony Nino.